Fitted elastic cord around the bottom of the cover to help keep it securely wrapped around your Honda generator. 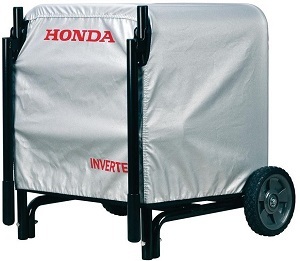 It is essential to have your Honda EB2800i or EG2800i Generator to be clean and ready when you need it the most.With this generator cover you can protect your Honda portable generator from mud, UV rays, durt, weather and dust while your inverter generator is in the storage shed, garage or on the road with you and your RV. This cover fits well even when the generator is on the wheel kit. 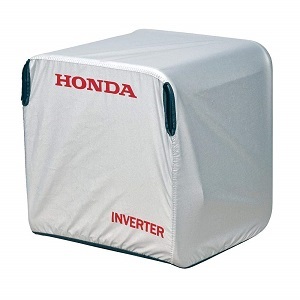 Dimensions of this Honda generator cover is: 19" D x 17.5" H x 19" W..
Silver with Red Honda Name. There are openings for the handles of the wheel kit if you have your generator mounted on wheels. Cover has an elastic band for a custom fit on your generator. Properly storing your portable generator in a shed or garage will help reduce repair expense and better ensure that your generator is usuable when you need it during a power outage. Here are some steps you should take when placing your unit in storage for more than 30 days. Leaving fuel in your unit while in storage can cause gum deposits to form in the carburetor, fuel tank and other fuel system parts. Also drain oil from the crankshaft while the unit is still warm. Once the generator is properly prepared for storage, allow it to cool down and wipe it clean from dust and debris. Wiping off the dust will ensure the unit's cooling air slots and openings are free of any obsturctions. Place a properly fiting generator cover over the unit and if possible store the unit indoors. Even if your unit is stored in a garage or shed it can still accumulate dust and dirt while sittling there. The generator cover helps keep your unit clean and ready for use even while in storage for months on end. If you use your portable generator on work sites and transport it in the back of your pickup truck, then it is a good idea to place your generator cover on your unit while traveling. This help keep flying dust and dirt out of the unit. Being sure to keep your Eb2800i or EG2800i clean and dry is so important because when you really need it you want it to be in good running order. These size generators pack a lot into a small package which provides 2,800 watts of quiet and fuel-efficient advanced inverter technology alternative power. So, be sure and keep yours dry and dust free while storing it or carrying it in the back of your truck. This cover was made to fit the Honda EB2800i or EG2800i Industrial Portable Power open frame inverter generator.